The first step in any recovery is acknowledging the problem. The second step is having faith that a power greater than oneself can restore sanity. Joe purchased his home four years ago for $300,000. He currently has an outstanding mortgage balance of $270,000. The appraised value of his home has fallen to $150,000. If he sells it for $150,000 today, he will eat a loss of $150,000 which is not deductible for tax purposes. Joe can afford his mortgage payments and has not missed any. Since he doesn’t qualify for a loan modification, what options does he have? For one, he can continue to pay off the $270,000 debt, plus interest, on a home which has lost 50% of its value, thus incurring more than a $150,000 loss spread over time. Or if he finds this distasteful, he can simply walk away from the home and let the bank and the wizards of DC deal with it. Other than that he really doesn’t have many options. I say he doesn’t have many options, because I know some folks who have already walked away from their homes, renting them out to others while they rent elsewhere, with the idea of dumping them for a loss if things don’t improve in a couple of years. Does it make sense for Joe to sit there, stuck in a home that he can’t sell or refinance; making a payment every month on what he knows is a bad investment? Would you invest $300,000 in something that you thought would be worth half in the future? Although housing prices may increase over time, they didn’t get to where they were overnight, and life is finite. Joe is 50 years old and doesn’t have another 30 years to waste. So what can the government or private sector do for Joe? One of the things eating away at Joe everyday is that he sees House B, a bank owned foreclosure which had an original cost of $600,000, still has an appraised value of $300,000, but has a selling price of just $150,000. Joe would love to purchase House B but he is not able to get out of his current mortgage without incurring a $150,000 loss. Joe would have to come up with a $120,000 payment to get out of his present mortgage, plus make a down payment on the bank owned home, which would make him even worse off. 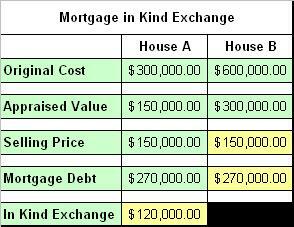 A Mortgage in-kind Exchange is a unique idea that would allow Joe to sell his home for a loss and rollover the remaining $120,000 loan balance into a more valuable home. It would allow Joe to purchase House B for $150,000 with a $270,000 mortgage. House B would have an appraised value of $300,000 and a mortgage debt of $270,000, thus making Joe whole. How it works – Joe is allowed to hold an option to purchase House B for a small earnest money deposit of $1,000 which will take the home off the market for up to a year giving him time to sell his old home. If the old home doesn’t sell within a year, Joe may either extend the option by making another deposit, or forfeit. Benefits and costs – Joe would be better off by being allowed to purchase a more valuable home for the same amount owed on his underwater home. The banks would be better off because they will have reduced their REO inventories without incurring as big of a loss. The economy will improve by allowing faithful homeowners a chance to improve their personal debt-to-equity ratios. Housing prices will improve by removing homes selling for less than fair value from the market. The cost to taxpayers would be zero. The banks can get involved by matching up faithful homeowners with qualified properties. The government can get involved by getting out of the way, and encouraging the free market to push solutions rewarding those who deserve it the most.